Bring your Cardinals questions and comments, and talk to Post-Dispatch baseball writer Derrick Goold in a live chat at 2:30 p.m. Monday..
That makes sense. I feel comfortable if Wieters had to start more it’s just hard to not get excited about knizner. Especially with how well he can hit. Hopefully the defense keeps getting better. And it has. So he's trending up, up, up toward the majors. Mikolas should grow the mustache back. Makes him look meaner. He's working on one. He explained how he shaved the previous one because it was a spring mustache and had spring mojo and he was getting rid of that. Why does everyone seem to be so high on Milwaukee and their start to the season? If you look past the record, they have scored the same amount of runs as the Cardinals, but are -3 in run differential why the Birds are plus 16. They're also 5-0 on 1 run games. That's unlikely to continue. Color me unimpressed. You have been so colored. I think it's -- what's the word, I'm looking for -- something like self-fulfilling prophecy, but that's not it. Anyway, it's when something is predicted to happen, it happens, and then people celebrate that they predicted it would happen. The Brewers were expected to be good. They are. They've been lucky. Whatever. But they are good, and thus folks who expected them to be good are broadcasting their goodness as a way to validate the original prediction that they would be good. It's a feedback loop. And that's the Brewers. I still think they're thin on pitching. Did you suggest earlier that Francisco Pena is still in the organization, or did I misunderstand? He is still in the organization. Assigned recently to Memphis. Luke Weaver is part of the DBacks rotation and he has an ERA higher than 5.00 in three starts, and he's averaged just more than five innings a start. Carson Kelly had a strong spring for Arizona, and he has started six games for the DBacks so far at catcher. He's hitting aroudn .200 in a handful of at-bats and has an RBI. Could Carpenter be a Ben Zobrist type player by the end of his contract, playing a little bit of everywhere but no set position? He was supposed to be that three, four years ago. He might be a DH-type player. While I've enjoyed the swiss army knife role Gant has provided, if he's a guy that could give you six innings/start, and if Hudson struggles to complete five innings, should they reverse their roles? Yes. But neither of what you've suggested here is a given, yet. Is the 4 outfielder alignment for Carp versus Cincy trending to be something he might be forced to adapt to with other teams? It didn't exactly work all that great. But, hey, probably. I have a photo on my phone -- hold on, let me try and find it. When I took this photo -- the Reds had all seven position players in fair territory on the grass, including Joey Votto playing back at first base. The count had two-strikes on Matt Carpenter and this is the absurd shift he saw. I"m working really hard to see the upside (that means even IF Fowler returns to 2017 Fowler after watching Martinez/O'Neill absolutely destroy the ball in the last two games (LA/2nd Reds Game). Please tell me how much longer we have to see everyone get excited over every walk/semi hard hit ball going forward. I guess you could say I'm done with the Fowler Experiment. You may be. The Cardinals are not. They've made an investment and a commitment. 4 games does not a season make...I get that. But at what point for a starting pitcher is it no longer considered small sample size? Specifically in regards to Mikolas...all of his numbers appear to be down so far this year and that also matches the eye test where it appears that there are more hard hit balls this year. I'm trying not to be worried yet but I have to admit...I'm starting to! Has to be more than a month. Don't ignore spring training, but don't rely on it without context. But it's more than a month. May showers are a good time to look at starters. I'm glad someone brought up a Skywalker or I would have forgotten to ask - any additional thoughts on the new trailer, and the new Mandalorian series announcement? As far as scenery, I was awestruck by Estadio de Beisbol Monterrey. OK, OK, I'm a sucker for mountains, and at every turn in Monterrey there seemed to be a striking view of a mountain. The city is surrounded by them. The mountain that appears beyond center field is a key part of the Sultanes logo -- it rests atop the interlocking MTY, in silhouette. It's a slick logo, I think. So, since the ballpark catered to my fondness for mountains and gave us a striking view unlike any other ballpark in the majors of a mountain, that scores high. It wasn't a big-league park. It wasn't big enough. It didn't have some of the necessary amenities. And so on. So it's more of a Class AAAA ballpark with a Hall of Fame view. Have not had a chance to really dig into either the trailer or the new TV stuff. I haven't seen any of the footage of the Mandalorian series. That's my reward for later this evening when I get home and have a chance to unplug from the baseball for a moment and catchup. A trend I've noticed with the starters. They get ahead 0-2 and then they'll waste some pitches that aren't close enough to even entice a swing, or they nibble, until the count is full. Their pitch count gets high and they can't go more than 5-6 innings. Considering every pitcher is doing this, is it something that the pitching coach or Molina is asking them to do? Why not just go right at the hitter when you get two strikes on them? This is a question that preoccupies the manager and the pitching coach, and honestly it's something that Jack Flaherty has talked about as a trend that he's trying to break. You bring up some of the interesting reasons for it happening, but don't disregard the lineups the Cardinals have faced. San Diego was very impressive at working the count. I found the Padres' lineup intriguing and savvy and deep and far better than I expected -- and a big part of that was how the Cardinals pitchers would get ahead but not control the at-bat. The Padres did. The Brewers do that well, too, and the Reds have a solid lineup. So that's a handful of teams the Cardinals have played in so few games that do that well -- and will work counts well all season. I agree that Flaherty, Mikolas, and others could be more aggressive with 0-2 counts and more aggressive in strikeout counts, and the pitchers and Molina have echoed that sentiment in one way or another in recent weeks. I understand the series occurred during Holy Week, and Mexico is predominantly Catholic, but having watched both games, and seeing the occasional view of the stands, the stadium appeared half full at best. I'm not opposed to MLB teams playing abroad, but if the Reds were the home team, they sacrificed two home games. Does MLB compensate the team giving up the home games to make up for lost revenue from concessions, parking, ticket sales, etc.? What about the stadium workers that miss out on those two working days? It was more than half full. At worst, the ballpark was 2/3 full. There was also a real late arriving crowd aspect to the games that I didn't expect. Yes, the teams are compensated for giving up two home games to make this happen. Hence, the sponsorship. Ford helped underwrite some of those costs ... As far as the stadium works -- that's an excellent question. It depends on the setup that the Reds or their contractors have with the employees. But I would imagine in most cases those workers are paid by game, and those are not games that they're getting, at all. It's a good point if you have an issue with that and argue on behalf of the workers losing a wage for baseball to go abroad. Derrick, I cannot believe the shift employed by the Reds against Carpenter ! The whole left side was wide open ! Even more unbelievable was that Carp REFUSED to bunt...Maybe I dont understand the "new Baseball", but do these new metrics support the strategy of Carp doing more damage by swinging away into the shift vs a 100% chance of him getting on base via ANY kind of decent bunt?! Isnt his job as leadoff hitter is get on base? 1st base was a gift, and he refused to take it. Obviously, the Cardinals support this, but I really dont get it. Can you help me understand this rationale ? -- It's hard to hit, especially the other way, and even to bunt. It's really hard. -- It's harder to hit, and even to bunt, with the way he's getting pitched. -- Some players are paid to do damage, and must bash through shifts, not finesse. That's just some of my views on it. If there's one takeaway that maybe we can agree on and that you would accept is that even the bunt isn't a given, and going the other way for a base hit isn't a given, and that hitting against the pitching in the majors these days is really hard. Scouting reports are really good. Pitchers are really effective. And, sure, bunting should be more of a certain thing. I'm not sure I understand entirely, but all of the Mexico Series signage -- including the Mexico Series -- was backed in navy, and that is an official format of the Cardinals' logo. 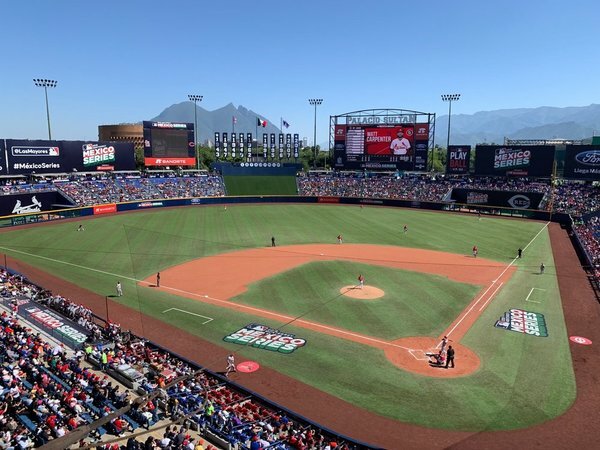 Heck, the Reds logo out in RF at Estadio de Beisbol Monterrey was backed by navy. Maybe you're talking about something else, but that was the style of all the signage, regardless of the team. It seems a lot of teams will be after MadBum. Does he have any control over what team he's traded to as part of his contract? According to reports, he has a limited no-trade that can block trades to eight teams. I didn't quickly find who those eight teams are. It's not unusual for those no-trade clauses to include some of the deep-pocket teams so that the player has leverage to increase his salary or get an extension as a condition of the deal and take advantage of the team's interest in him for financial gain. I have no reason to believe that Bumgarner would have the Cardinals on that block list unless he is allergic to spring training in Florida (no reason for that to be a factor in July) or he wants leverage if he goes to a team like the Cardinals to get a financial benefit. This will be more of a factor and more clear as the season progresses. Munoz also returned to Memphis. O'Neill remains in center field for injured Bader as Cardinals, Hudson take on Brewers. OK. That could have gone smoother. Apologies for the long delay. Like this chat, my flight home was apparently without a captain for awhile. So ... Hey, bonus time in Dallas. I read the article but still don't quite get how playing games in Japan, London, etc, is "good for the Cardinals brand". I do understand what the phrase means, but I just don't understand how these various foreign jaunts will help in the marketing of the Cardinals. Can you elucidate further, please, the article really wasn't very specific on how these trips would be good for the brand. Well, it would introduce the Cardinals to new markets, according to officials. In the article, Mozeliak specifically said that it would strengthen the brand by taking the Cardinals to people who don't come to St. Louis. He called it a "touchpoint" with fans -- I believe -- and his point was that not everyone in Cardinals Nation can go see the Cardinals at their home, so sometimes maybe the Cardinals could spread their wings and go see them. In the story it references the Spanish-language broadcasts that are also part of this outreach, and you're right I could have gone into greater detail about that repeated the purposes that the Cardinals have for doing those broadcasts. First, they want to reach out to the Hispanic population in St. Louis. Second, the put those broadcasts online and stream to fans around the world because they want to have a larger presence in Latin communities around the globe, and that includes places like Puerto Rico and the Dominican Republic, where the Cardinals are already popular these days because of Yadier Molina and Carlos Martinez -- but now they're strengthening that bond by being available to fans there. Being present for fans there. They want to be familiar to fans there. It's a global game. So might as well be a global team.